Do puppies feel guilty and do dogs show shame? Maybe you arrive home to find only empty Halloween candy wrappers, or perhaps the baby dog isn’t yet reliably potty trained and “tells” you that he’s made a pile somewhere. When your puppy meets you at the door, head low with ears slicked back and eyes averted, is that a canine apology? Certainly, they can ACT as though they feel guilty. At least, the behaviors mimic what humans associate with feeling shame or apology. Whether or not this accurately reflects the dog’s true feelings is open to debate. Dogs do appear to care how humans feel, and not just when we’re upset. We know from our own experience that pets often seem to sympathize when we feel lonely or sad, tearful or joyous. The puppy may solicit petting and snuggles that cheer us up or spin in circles of happiness when we’re happy. My dog Magic has learned what makes me giggle and smile and chooses behaviors like a well-rehearsed comedian to garner the most laughs. And we know there are health benefits to keeping pets. In fact, some canine studies have shown that dogs feel empathy not only for crying owners but to strangers who weep. It seems dogs might, in fact, have the capacity to feel guilt. Or at least to anticipate that they may have done something wrong. I’m sure you’ve had the experience of walking back into the house where your pup—instead of greeting you with jumping up and wags for attention—slinks around and won’t look at you. And he looks even more guilty as you stalk about the house searching for whatever damage has been done. Maybe you find something he’s chewed. Or perhaps he’s been dumpster-diving and potentially swallowed some object that could cause intestinal blockage, so you’re understandably fearful and concerned. Your tone of voice and actions teach your puppy how to react the NEXT time, too. When dogs learn that you get upset if they scatter the garbage, they theoretically may “act guilty” after such behavior and tell on themselves even before you know something has happened. That’s one explanation, anyway, but honestly, I don’t buy it. Here’s why. 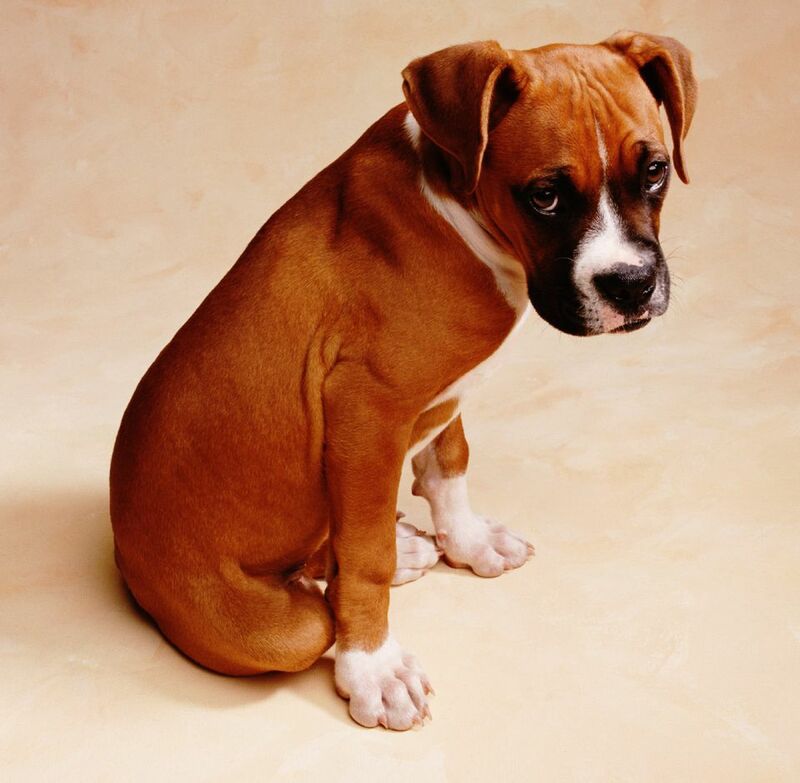 Your puppy displays these same apologetic behaviors when they’ve done nothing wrong. Often an owner walks through the door, and immediately the puppy acts guilty. So your voice goes into scolding mode as you search high and low for the infraction—but you find nothing wrong. However, Junior-Dawg still acts guilty. What’s up with that? You may have inadvertently taught your puppy to apologize based on certain body cues and context of the environment. Your tone of voice, the way you communicate with the puppy and “loom” over top of him, make strong eye contact in a canine-language challenge, all associated with the trigger of a homecoming, can teach the dog to act contrite every time you return home, whether he’s done something wrong or not. Puppies quickly learn to associate your homecoming with a raised voice and your displeasure after only a couple of repeated bouts of you finding true infractions. But he won’t necessarily connect your homecoming anger with having done something wrong because puppies have a very short memory when it comes to infractions. For them to connect the “bad deed” to your displeasure, you must catch them in the act so they associate digging up the potted plant is illegal. After you’ve expressed your anger during homecomings a couple of times, the puppy learns to associate your arrival with you being angry. Even if he’s done nothing wrong, he’ll do his best to reduce your displeasure with his “apologetic” behavior. Puppies do this with older dogs, too, to diffuse potential aggression. It’s a way for them to tell the adult canine that “you’re the boss.” When your puppy slicks his ears down and grovels on the floor or even rolls over and wets—that’s called submissive urination—these are all doggy signals designed to diffuse aggression. They’re called appeasement signals or sometimes termed calming signals. Adult dogs do this to show other canines (and puppies) that they aren’t all gruff-and-grumble and the fearful pooch has nothing to fear from them. They’ll play bow to invite the other dog to play, for example. This is categorized as a “meta signal” that means other things like growls or wrestling that follow are meant in jest, sort of a doggy make-believe similar to a human dad playing “scary monster” to chase the kids (making sure they first know it’s just pretend). So does your puppy feel guilty when he empties the kids’ Halloween sack? Is he ashamed for chewing up your new shoes? Does he apologize or “tell on himself” when he’s done something wrong? Honestly, nobody knows for sure. But it’s clear that our dogs do pay exquisite attention to their human’s behavior and emotions, and react accordingly to make us feel better and diffuse our upset feelings. How cool is that?! It’s up to us, as caring and savvy pet parents, to do the same for the fur-kids that we love.